(Lancaster, Pa., June 4, 2018) – The Atlantic League of Professional Baseball (ALPB) today announced the recipients of the league’s Player and Pitcher of the Month awards for April/May of 2018. 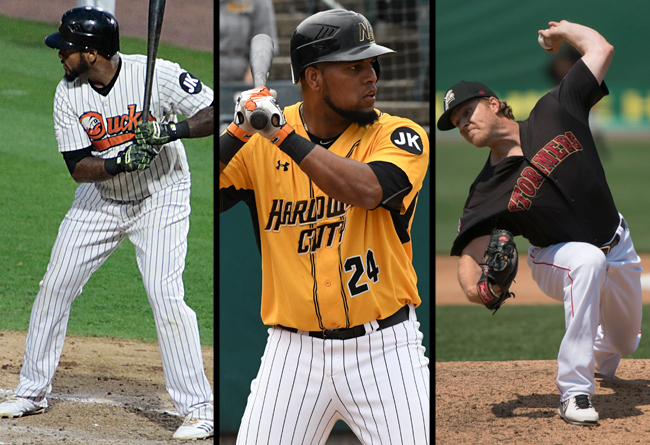 Long Island Ducks infielder Jordany Valdespin and New Britain Bees infielder Deibinson Romero have been named the Atlantic League’s Co-Players of the Month. Valdespin led the league in five different offensive categories during April and May, including hits (45), runs (29), total bases (73), extra-base hits (17) and at bats (131). Additionally, he ranked second in slugging percentage (.557) and triples (3), third in doubles (10) and seventh in batting average (.344). The four-year MLB veteran played in each of Long Island’s 31 games during that span as well. Romero led the Atlantic League in slugging percentage during April and May while also ranking in the league’s top five in five other categories. He was second in the circuit in home runs (6), RBIs (26), and total bases (67) while sitting fourth in hits (42) and batting average (.356). The 31-year-old played in and started 31 of New Britain’s first 32 games this season and compiled a .421 on-base percentage. Lancaster Barnstormers left-handed pitcher Nate Reed has been named the Atlantic League’s Pitcher of the Month. The southpaw led the Atlantic League with five wins, posting a perfect 5-0 record, along with a league-best 1.04 earned run average. In 26 innings of work, he conceded just four runs (three earned) on 20 hits and six walks while striking out 25 batters. Additionally, the 30-year-old held opponents to a .215 batting average and a .275 on-base percentage. Lancaster won all six games that Reed started between April and May.